I’d never even heard of coriander until I started looking through recipes in my Grammy’s old cookbooks. There was one for some delicious meatballs that called for coriander, so I went out to the store and got some… and immediately fell in love with its fragrance and taste. I also hit the Internet, looking for any information I could find about this wonderful herb. Coriander is a wild-growing plant throughout southern Europe, northern Africa, and southwestern Asia. For this reason, its leaves and dried seeds are often found in use in Asian, Middle Eastern, African, and Spanish-inspired cuisines. In Mexico and North America, its leaves are known as cliantro (the Spanish word for coriander). But coriander is more than just a flavorful, aromatic add-on to your favorite dishes. It also happens to be really good for you. Here’s a list of just some of the many health benefits of coriander. Heart health: Coriander contains some heart-healthy fatty acids, like linoleic acid, oleic acid, palmitic acid, and stearic acid. It also contains ascorbic acid (vitamin C). All of these have proven to be very effective for reducing total blood cholesterol levels and the level of bad (LDL) cholesterol that’s found in arteries and veins are largely responsible for cardiovascular issues like artherosclerosis, heart attacks, and strokes. But, in addition to this, coriander helps raise the levels of healthy cholesterol (HDL), which works as a preventive agent against a number of cardiovascular problems, such as high blood pressure, heart, attack, and stroke. Coriander is also high in iron, which helps people who suffer from anemia and helps increase the overall health and strength of the body. Eye health: Coriander is loaded with antioxidants, vitamins A and C, and minerals like phosphorous, all of which are known to prevent vision disorders, including macular degeneration (something I’ve always been afraid of developing). It can even help reduce the strain and stress your eyes experience over time (especially if you stare at a computer a lot). Coriander’s antibiotic properties protect the eyes from a number of contagious diseases, like conjunctivitis. For this reason, coriander oil is often used as an essential ingredient in a number of eye care products. Skin health: Cineole and linoleic acid (as mentioned before), are both present in coriander, and they possess antirheumatic and antiarthritic properties. They help reduce the swelling that is caused by these two conditions, leading to increased functioning and overall better appearance. Coriander’s antifungal, antioxidant, antiseptic, detoxifying, and disinfectant properties are ideal for clearing up skin disorders such as dryness, eczema, and fungal infections. Menstrual health: Coriander can also be used to help regulate proper menstrual cycles and reduce the pain a woman experiences during her period. Digestive health: Some of the essential oil components found in coriander, such as borneol and linalool, aid in digestion by helping the bowels and the liver function as they should. This helps to reduce the risk of diarrhea. It can also be helpful in curing some forms of diarrhea due to its antimicrobial and antifungal properties. Coriander can also be used to prevent nausea and vomiting. Immune protection: Coriander is known to have strong anti-histamine properties that can reduce the bothersome symptoms of seasonal allergies and hay fever (this is something I seem to deal with constantly). It can also be used to reduce allergic skin reactions resulting from insect bites or contact with plants. Internally, it can ward off anaphylaxis, hives, and dangerous swelling of the throat and glands. It’s never a bad idea to protect yourself against allergic reactions, especially since it is difficult to know what you might be allergic to, until you come in contact with it for the first time! Besides this, coriander can even help protect you from salmonella poisoning because of its unusually high levels of dodecenal. The vitamin C and iron, as well as the anti-infectious, antimicrobial, antioxidant, and detoxifying components of coriander strengthen the immune system. As such, they can ward off smallpox infections, and they can also soothe the symptoms experienced by small pox patients, where the disease still exists. Blood sugar: Coriander aids in the regulation of the proper assimilation and absorption of sugar and results in the lowering of blood sugar levels. This is especially helpful for patients who suffer from diabetes. 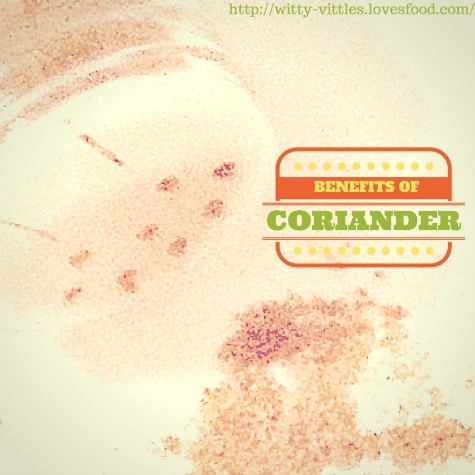 The health benefits of coriander are numerous, and its flavor is out of this world. If you haven’t yet tried cooking with coriander, I suggest you run right out to the store and get some today. I put some in my eggs this morning and added some to the barbecue sauce I made to use with some leftover chicken for lunch. Coriander is an excellent addition to just about any dish. Just try it and see for yourself!